W3schools has published a research page with Operating system statistics and Windows family counts 90% of the most used operating systems. As some of you may know, there are some CSS bugs that can be encountered only using a specific OS, even if you use the same browser. I remember while I was working on a project and I had to setup some images as background, it showed great using Firefox on my Windows but I’ve been informed that on Firefox for Mac OS X, it was displayed 5px down, enough to ruin the design. If I would have used the MAC I would have tried to make it look right there and possibly ignored the rest of 90% of users, as I couldn’t know about the problem. Maybe the Windows Vista was a bad OS but those of you who have installed Windows 7, I am sure you were surprised in a good way. At least I am. While there are some tools for testing websites in IE using IE Tester or spoon.net/browsers, there are differences and the big minus is that you cannot install the IE developer toolbar, as you can do on a native IE6 or IE7 (the toolbar is not Firebug, but helps!). If you have Windows 7, you can run native IE6 and IE7 using XP Mode feature. I found an article that shows you how to install a virtual machine and setup XP Mode. Now you may think, it is very good to stay away from viruses and it is for the regular users. However, we developers, are responsible and need to identify potential threats, while having a mac you won’t be aware of those and the rest of 90% of users might get infected. I got a job recently, where I had to improve a Joomla website. While the website had no issues, when I tried to log-in in administrator area, my local Bitdefender antivirus, blocked some Trojans. The Mac users might still have a solution. Chrome seems to identify better infected websites, and won’t let you access it, so you will know at least that there is a problem. However, if you try to clean up an infected website, you still need an antivirus to point to the infected files but Antiviruses for Macs detects threats for Macs, not for PC and so, not for majority of users. Productivity is important, that’s why each 3 years or so, I personally, need to change my laptop with a more advanced one, as technology is moving faster and the software demands more resources. Even if you use a Mac, you still need to upgrade it after a period and they don’t come cheap. While the Windows is more vulnerable to viruses, buggier, not that stable as a Mac, I believe the points discussed above, should make you think about making the switch or decide a platform, as a web developer. 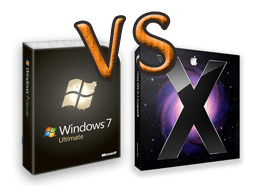 Let me know what’s you opinion regarding building websites on Mac OS X vs Windows. You raise some good points. I’ve been a Windows users for a looong time (managed to skip over the nasty Vista virus), and I will soon be taking steps into the world of Mac (I’m replacing my Dell with the dead motherboard with a used 13″ Macbook pro). I’m hoping that I’ll see an increase in productivity with some of the tools available only on a Mac. My main machine is a tower running XP, but I’ll be upgrading that to Win 7 since I won’t need that license on my deceased laptop. I might even configure that to dual-boot to a Linux flavor. I hadn’t considered the anitvirus issue. Thanks for that heads-up. I agree that there are pros and cons of each system, and that’s why I will continue using two machines for the foreseeable future. That’s what I was thinking too. I’ll get the IMAC but will still keep my Windows based laptop.